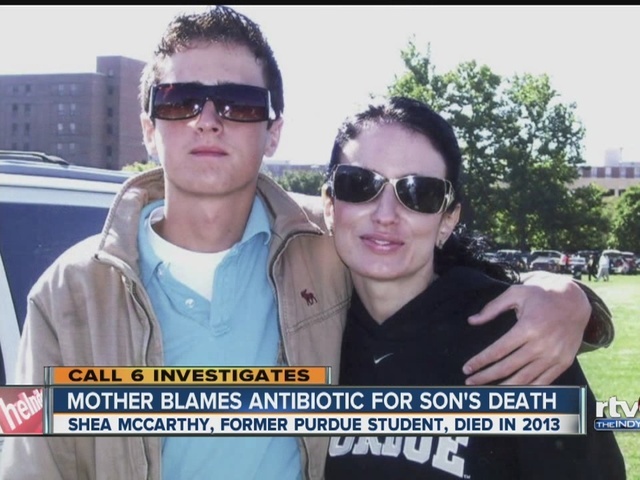 INDIANAPOLIS -- An Indiana mother is pushing for change at the national level after losing her son, a Purdue University student, in what she believes is a drug-induced death. After his freshman year at Purdue University, Shea decided to have surgery for a deviated septum. “We just considered it a minor surgery,” McCarthy said. Up until that point, Heather said her son had no major health problems, aside from asthma when he was a child. Prior to the surgery, the doctor prescribed 30 days of a powerful antibiotic, Levaquin, records show. Levaquin is the brand name for levofloxacin, which is part of a class of drugs called fluoroquinolones, intended to treat major infections like pneumonia, anthrax exposure, plague and urinary tract infections. Heather said her son started acting strangely after taking Levaquin, and told doctors, friends and family he thought the drug was to blame. Shea quit taking the medication, but the side effects still lingered, according to his mother. The citizen petition requested the FDA add a black box warning on the Levaquin label for “serious psychiatric events,” but the FDA has not yet required that language on the label. Shea’s anxiety got so bad, he dropped out of school and ended up in the mental health system, where doctors prescribed him more drugs for bipolar disorder. On Oct. 23, 2013, Shea jumped out of a second story window, got in his car, and crashed into a cement embankment. He died at the age of 24. Call 6 Investigates obtained the FDA database of adverse reactions to Levaquin and found more than 31,000 complaints since 2010, including 179 reported deaths. Hundreds of patients complained of depression and anxiety, according to the database. Critics of the drug, however, estimate 15,000 deaths related to Levaquin since 1997. Fluoroquinolones already have a black box warning for tendon rupture, but there’s a push for even more label warnings. Heather McCarthy testified in November 2015 before an FDA advisory panel convened to talk about fluoroquinolones. “This was a drug-induced death that was unnecessary,” McCarthy told the panel. She said it was shocking to hear similar stories of people impacted by the powerful antibiotics. Consumer advocacy group Public Citizen also testified at the hearing. Former Indiana State Health Commissioner and family physician Dr. Richard Feldman called fluoroquinolones a “big gun” that are prescribed every day in Indiana. “The concern I have is, are they being used appropriately,” said Feldman. Feldman prescribes fluoroquinolones for significant infections, and often, when another antibiotic just doesn’t work. He said the public needs to keep in mind that all medications have side-effects. Feldman also said people need to keep in mind that side effect figures reported to the FDA can be deceiving. “Just because it’s been reported, doesn’t mean it’s related,” said Feldman. In addition to testifying in Washington D.C., Heather McCarthy has filed a lawsuit in Lake County against the doctors who treated Shea, alleging they ignored her son’s assertion that Levaquin caused his mental health problems, and that the doctors were inflexible in their treatment of her son. The doctors’ attorneys did not respond to requests from Call 6 Investigates for comment. Heather’s mission is to be her son’s voice and tell everyone about the side effects of fluoroquinolones. “I would tell him if I could is, ‘you were right, you were right,’” said Heather McCarthy. Alleged victims of the antibiotics filed a lawsuit accusing former FDA commissioner Margaret Hamburg of profiting off the drugs despite debilitating side effects. The FDA declined our request for an on-camera interview about fluoroquinolones. “In November, the FDA convened an advisory committee meeting to receive expert scientific advice regarding the benefits and risks of systemic fluoroquinolone antibacterial drugs for the treatment of acute bacterial sinusitis, acute bacterial exacerbation of chronic bronchitis and uncomplicated urinary tract infections. This included a discussion of the data regarding the benefit of these products to treat these conditions as well as the adverse effects of the drugs. This meeting provided valuable information and perspectives to help inform the FDA’s decision-making processes. The FDA plans to consider the input from committee members and the public from the advisory committee meeting and determine what future actions may be appropriate. This is an important issue for the Agency. The FDA will keep health care providers and the public informed of new information regarding the use of systemic fluoroquinolones to treat acute bacterial sinusitis, acute bacterial exacerbation of chronic bronchitis and uncomplicated urinary tract infections. “Our first priority is the well-being of the people who use our medicines. LEVAQUIN® (levofloxacin), part of the important fluoroquinolone class of anti-infective prescription medications has been used for nearly 20 years to treat bacterial infections, including those that may be serious or life-threatening. LEVAQUIN® is part of the important fluoroquinolone class of anti-infective prescription medications, and its safety and efficacy profiles are well known and established. We believe the existing labeling appropriately reflects the current understanding of the safety and efficacy of the fluoroquinolone class. We continue to discuss and collaborate with FDA in relation to the Committees’ recommendations and to any additional steps to continue to support the safe and appropriate use of fluoroquinolone antibiotics.